Market Risk Analysis is the most comprehensive, rigorous and detailed resource available on market risk analysis. Written as a series of four interlinked volumes each title is self-contained, although numerous cross-references to other volumes enable readers to obtain further background knowledge and information about financial applications. Volume I: Quantitative Methods in Finance covers the essential mathematical and financial background for subsequent volumes. 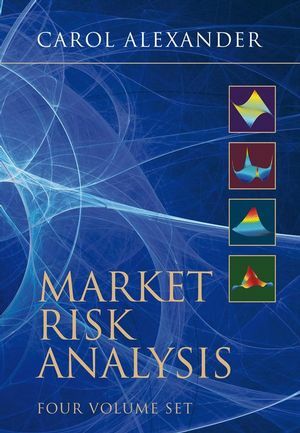 Although many readers will already be familiar with this material, few competing texts contain such a complete and pedagogical exposition of all the basic quantitative concepts required for market risk analysis. There are six comprehensive chapters covering all the calculus, linear algebra, probability and statistics, numerical methods and portfolio mathematics that are necessary for market risk analysis. This is an ideal background text for a Masters course in finance. Volume II: Practical Financial Econometrics provides a detailed understanding of financial econometrics, with applications to asset pricing and fund management as well as to market risk analysis. It covers equity factor models, including a detailed analysis of the Barra model and tracking error, principal component analysis, volatility and correlation, GARCH, cointegration, copulas, Markov switching, quantile regression, discrete choice models, non-linear regression, forecasting and model evaluation. Volume III: Pricing, Hedging and Trading Financial Instruments has five very long chapters on the pricing, hedging and trading of bonds and swaps, futures and forwards, options and volatility as well detailed descriptions of mapping portfolios of these financial instruments to their risk factors. There are numerous examples, all coded in interactive Excel spreadsheets, including many pricing formulae for exotic options but excluding the calibration of stochastic volatility models, for which Matlab code is provided. The chapters on options and volatility together constitute 50% of the book, the slightly longer chapter on volatility concentrating on the dynamic properties the two volatility surfaces the implied and the local volatility surfaces that accompany an option pricing model, with particular reference to hedging. Volume IV: Value at Risk Models builds on the three previous volumes to provide by far the most comprehensive and detailed treatment of market VaR models that is currently available in any textbook. The exposition starts at an elementary level but, as in all the other volumes, the pedagogical approach accompanied by numerous interactive Excel spreadsheets allows readers to experience the application of parametric linear, historical simulation and Monte Carlo VaR models to increasingly complex portfolios. Starting with simple positions, after a few chapters we apply value-at-risk models to interest rate sensitive portfolios, large international securities portfolios, commodity futures, path dependent options and much else. This rigorous treatment includes many new results and applications to regulatory and economic capital allocation, measurement of VaR model risk and stress testing. Carol Alexander is one of the world's leading authorities on market risk analysis. She is Professor of Financial Risk Management at the ICMA Centre, University of Reading where she directs a vibrant research group focusing on quantitative financial risk management. In her role as Chair of the Academic Advisory Council of the Professional Risk Manager's International Association (PRMIA) she has been a driving force for the setting of global standards in the financial risk management profession. Her untiring work on the Professional Risk Manager's Handbook and on classroom and distance learning training courses now provides the means to achieve these standards. She has published around 100 academic journal articles, book chapters and books, and now ranks amongst the world's best-known authors in financial risk management and quantitative finance.